Glo-Toob has been in the market for more than a decade. Initially they made these signal lamps for the Military and Law Enforcer and now it is favourite for Divers and outdoor adventure sports. With the new introduction of the AAA series, it cuts down a lot of weight (34g) and size compare to earlier models. What is even better is that re-chargeable batteries can be used. Battery life span varies from 4 hours to 15 hours depending on the mode setting. There are only 3 settings high, low and flashing by twisting the waterproof battery cap. The signal lamp is waterproof up to 60 metres so basically can be used in any outdoor adventure sports. The signal lamp can be used as a camping lantern as well, ideally for solo and lightweight backpackers. However, there are more usage such as cycling warning lamp, night hiking signal lamp so partners can be easily located, pet collar lamp or as emergency lamp. If one little lamp can provide so many usage, it is definitely worth while investment. At the moment retailed price is around USD25.00 http://www.glo-toob-usa.com however we should be able to retailed at lower price. Currently they have 5 colours, Red, Green, Amber, White and Blue. So which colour should one choose is all depends on your usage. If planning to use as a lantern and not worrying about preserving Night Vision then choose white. The rest of the colours are capable of preserving night vision however only Red can be used at high light density with the rest of the colour needs to be on lower light density for night vision preservation. Green is the brightest light and can be spotted further away compare to Red when both on the same light density. Just tested on our dog, the setting was set to low because partners claims it was too bright on high setting. EDC lamp Red or Green??!!! 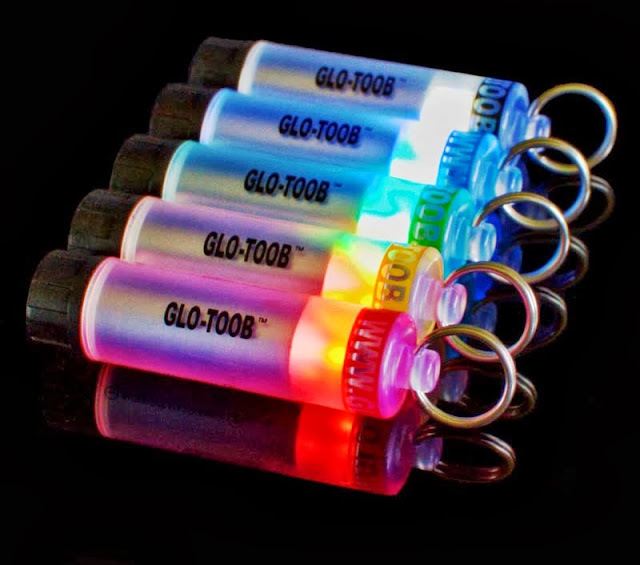 Glo-Toob is used by the military and law enforcement around the world, with uses ranging from marking personnel to avoiding friendly fire.